Amazing morning with the lovely Laura Stickley and Roo! After a much needed full body massage for the big little lady working on all the tension and anger in her neck, Laura tried a bit of crystal healing on her. Now the old sceptic in me would have thought Laura had officially lost the plot (she hasn't!) but I went with it and am converted! It was incredible to see Ruby choose her crystal and react in such a way with various releases as her chakra was unblocked and realigned. It was also mildly amusing to see Roo look like me after one too many wines as she readjusted to some head work and had to remember she had legs! Just incredible. Even Arnie picked up on it and was caught yawning and chewing looking rather googley eyed! Thanks again Laura for coming out to see us and helping Roo realise life isn't so bad and it's quite nice to be around us humans so killing us probably isn't wise! I can't thank Laura enough for the time and effort she has given my pony Bailey. Bailey was hit by a car in February this year and suffered severe muscle damage to her rear end. Bailey was very lame and stiff on her back end. I contacted Laura and told her what happened. She came out to visit Bailey and spent several hours getting to know her and treating her. Just after one treatment you could see the difference in Bailey and she seemed so much more relaxed and happy in herself. In only just a few treatments Bailey is getting back to her cheeky self rolling and bucking in the field. Thanks to Laura I'm getting my old pony back and Bailey loves her treatments. Firstly thank you so much again for coming out on Saturday to massage Kirby! I rode him tonight and the difference was unreal-no dead arm!!! Also he was back to being light in my hands on both reins. 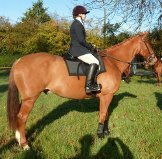 I also rode him in a cavesson with no flash as you suggested, and I'm so pleased i did!! He was so quiet and didn't fight at all. But instead went forward and was off my leg (and anyone who knows Kirby, knows that's not a normal thing!) 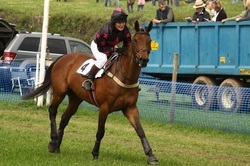 Cavesson bridle will be on order shortly :-). I'm so excited for his next treatment with you, as the results are great! Just to let you know we had our first lesson today on an all weather surface since you came. 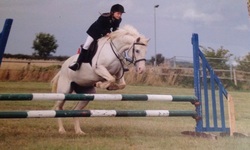 Honey was a completely different pony she had so much energy and was so much looser on her back legs and looked so much happier! Thanks so much for your help its really made a difference! 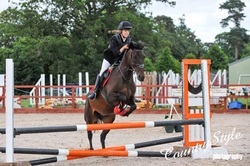 My gelding is a 8yr old, 15.3hh TB. 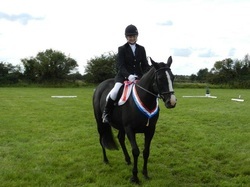 We compete regularly in all disciplines and had been going very well and often bringing home rosettes, one day I rode Harley and noticed that he was lame on his off hind, I gave him a couple of days off with a sachet of bute and noticed no difference, a week passed and I had decided to get the chiropractor out as he was due anyway, his pelvis was severely out of line also 8 vertebrae down his spine. I immediately called Laura to ask her to come and see my gelding following the chiropractors visit. When Laura came to see Harley he was nearly sound but still quiet stiff from the treatment he had had with the chiropractor a couple of days before, Harley soon relaxed once Laura started to massage and use different techniques all over his body, he had a lot of tension in his lower neck and around his withers and behind the saddle, also some wasted muscle around his thigh. 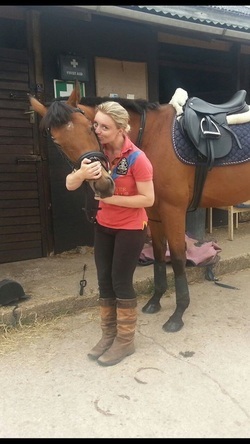 2 days after Laura visited, Harley was completely sound and back being ridden, I can not thank Laura enough for the work that she did with Harley and Laura is now going to come out and massage him once a month as a general maintenance as I feel this is going to benefit him for the future. Hi was meant to text earlier, finally had time to ride today and even though Lady was fresh she found it easier and wanted to work longer through the neck and not so tight like she normally goes. Hi the massage has helped loads with the dr, more relaxed easy to work on long rein and got best marks in her tests on fri, even in her first novice test! Hoping it will help her relax with sj too! Wondered if it be possible to book her in for another one please? Highly recommended and very quickly become part my horsey team. I can already see Laura being a long standing partnership and treating all and many horses of mine to come as what she has done with my most special boy has been fab! ... And I'm a little protective over him! :) thank you. I have known Laura for over 20 years now and when it comes to horse health she is the hardest working person I know. Her mare Jess has thrown probably every illness imaginable at her over the years and she is tireless in getting to the bottom of it no matter how long it takes, how much it costs or how hard she has to work. When I heard that she had taken a course in equine massage I knew how good she would be and how hard she would work to help others. Laura asked if she could use my 3yo BWBS graded mare Nina as a case study to which I agreed although not thinking she would find anything much to treat. However my mare is very stressy after a bad start in life and does box walk so Laura said she would like to try a relaxation technique to help her. As Laura started to work with Nina she noticed some tight spots near her withers and concentrated her work on these. Laura spent a long time working with her and Nina seemed to really enjoy it, relaxing so much that I found her sleeping in her box the next morning. Something unheard of as she finds it so hard to settle. When Laura finished she asked me to let her know if I noticed a difference whilst working Nina. As she is not yet backed and only in lunge work I left it a couple of days before working her. I noticed a huge difference! 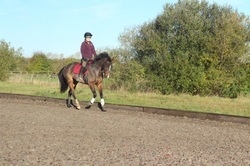 Previous to her massage Nina had found it difficult to complete a circle without pulling out or falling in on the right rein, she can now complete circles on the lunge looking so much more free and relaxed, a huge transformation! I am convinced that the work Laura did is responsible for this change. I am over the moon with the result and I already have a few friends wanting to book in! I would 100% recommend Laura, her kindness & dedication to anyone! Thank you so much for working your magic on Lady tonight. She is not the most compliant of equines but she is always so good for you which is an indication of how much she enjoys your massages. and look forward to many more for her. Thank you once again. Debra, Leah and Lady.